Another key test of a budget is the budgeted income statement. Here, you can check to see whether all the predictions and assumptions you made about sales, materials, direct labor, overhead, and S&A will bear fruit next year to generate net income. Like the cash budget, a budgeted income statement that predicts a loss indicates that you need to take the master budget back to the drawing board. A budgeted income statement looks like any other income statement, except that it’s for next year rather than last year. After all, you’re still in the backwards Bizarro Accounting world of budgeting. 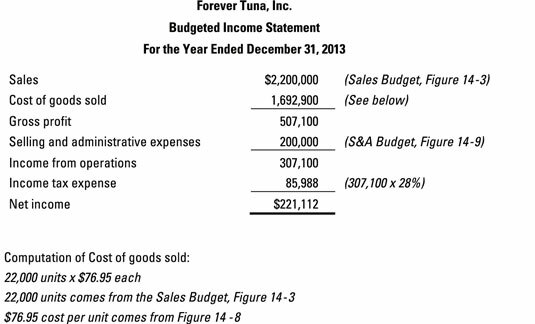 The following figure illustrates Forever Tuna’s budgeted income statement. The company’s income tax rate is 28 percent. Following the multi-step format, it starts with sales revenue and then subtracts cost of goods sold to arrive at gross profit. Then it subtracts S&A expenses to arrive at operating income; adds interest or dividend revenue; and subtracts interest or dividend expense to arrive at income before income taxes. Finally, it subtracts income tax expense to arrive at net income. Whew! The budgeted income statement indicates that, if all the assumptions of the budget hold true, Forever Tuna will report $221,112 worth of net income next year. Many companies also prepare a budgeted balance sheet based on the prior year’s balance sheet and the budgets for next year.